1. 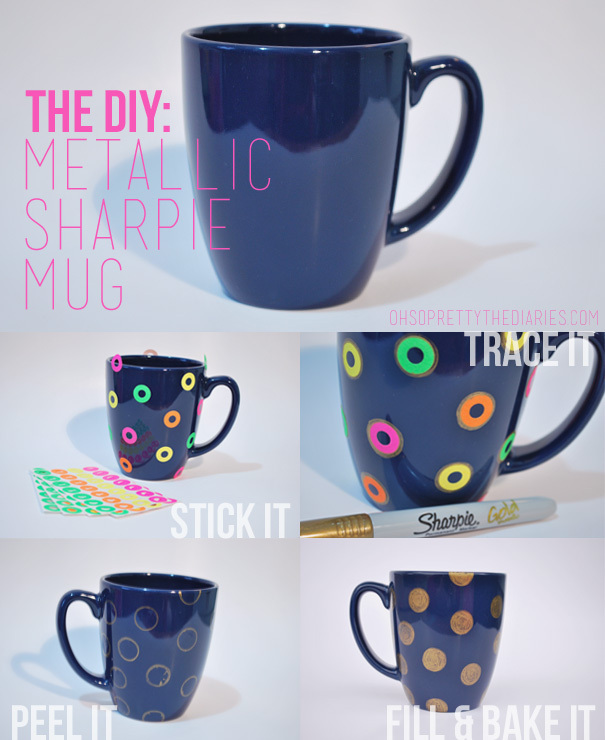 Stick reinforcement labels randomly all over your mug. 2. Trace the outside circles with your sharpie. 3. Peel the labels off. 4. Fill in the circles. 5. Put the mug in an oven for 30 minutes at 350 degrees. Perfect circles everytime! You can tell that the circles were done by hand up close but, it is still super cute! Just SO lovely sharpie art! Have an awsome weekend! I love mug art, especially using chalk board paint that let's you write all over them. I think that's really cute :') Great idea! This is great, but I think it's also very nice with the stick ! But after thinking a little they may not resist when whased.. but with color that be so great !